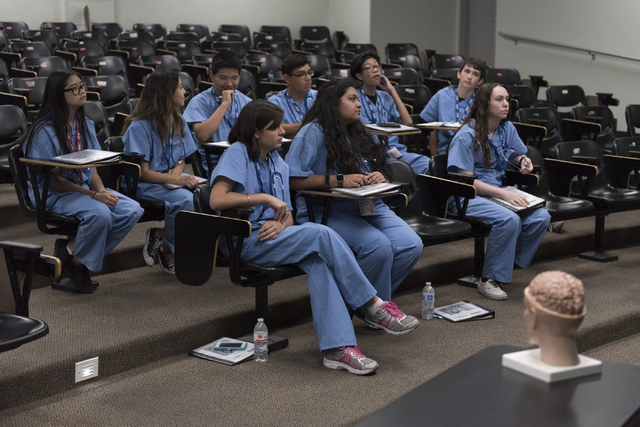 Sixty incoming high school freshman descended onto the University of Nevada, Las Vegas campus this past June to attend CampMed, a three-day physician residency experience. The annual program is sponsored by Desert Meadows Area Health Education Center, the Roseman University College of Medicine and several area universities and medical schools. Desert Meadows Area Health Education Center is a service of Vegas PBS Television. 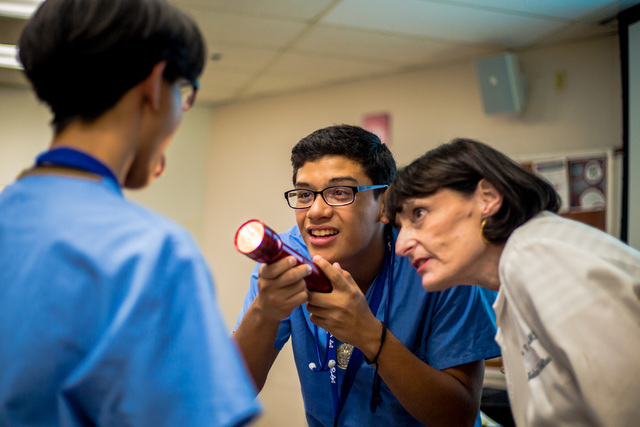 Considered a pipeline program, which are programs developed to generate interest in a career field, CampMed is designed to inspire and educate its participants on careers in the health care field. CampMed was developed by Dr. Ken Rosenthal, Ph.D., professor of biomedical sciences, director of microbiology and immunology for Roseman University College of Medicine. 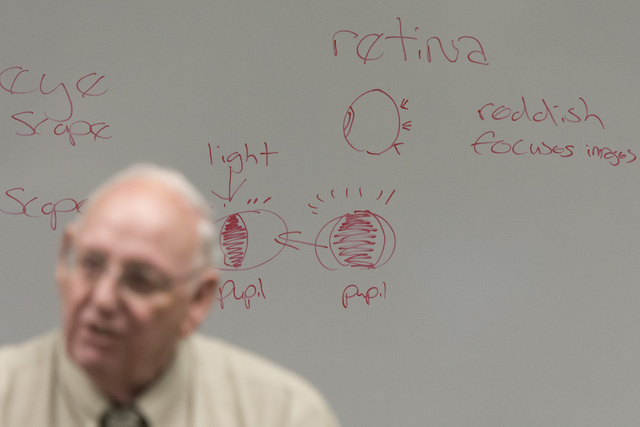 The Las Vegas program is structured after a program he founded in 1991 during his tenure at Northeast Ohio Medical University called MedCamp, where it operated for 25 years. Rosenthal took the position at Roseman in 2015. He was approached by the Desert Meadows AHEC board of directors one year later about implementing his Ohio-based program locally. Rosenthal’s program is short, focused and intense. It is developed specifically for incoming high school freshman. The three-day duration brings participants together and drives them to a higher level of achievement. 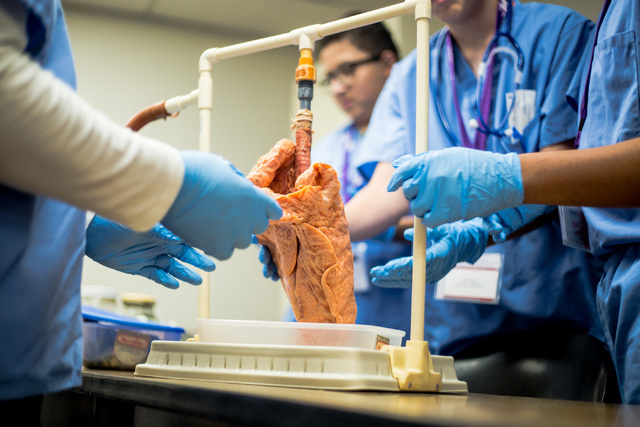 Simulating a physician residency program, students are given a fictitious patient and asked to diagnose the symptoms, while being educated on the different processes physicians use in their practice. During the first day, participants learn about all the different health care careers and play team-building games. At the end of the day, they are introduced to their hypothetical patient. Rosenthal, who is a microbiologist, developed the patient’s clinical case around infectious diseases because of its solvability. On the second day participants, dressed in official blue scrubs, are grouped into five different peer groups. Each group is mentored by an attending physician. 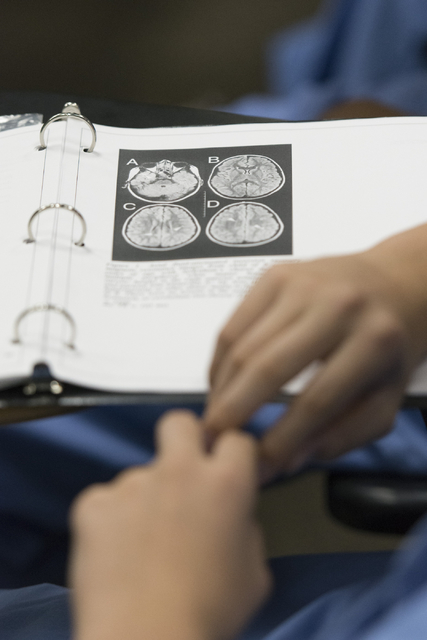 These groups rotate through five separate clinical labs and analyze their patients condition from the point of view of family medicine, radiology, cardiology, neurology and infectious disease. 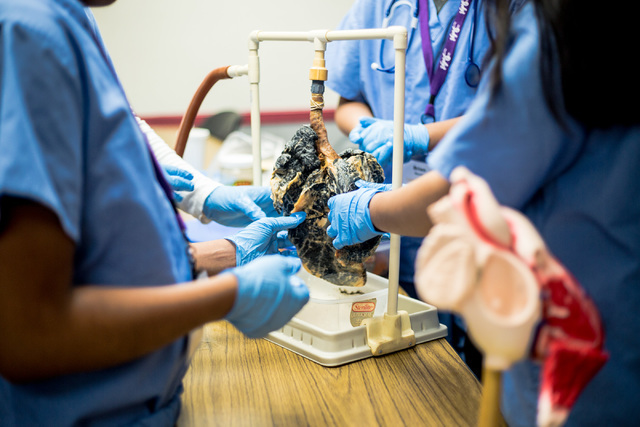 “For example, we found in the cardiology lab he (the hypothetical patient) had an enlarged heart,” Rancho High School sophomore Yordanos Tesfaye, 15, said about her experience at the 2016 camp. “In neurology we found out he was showing jerky movements. 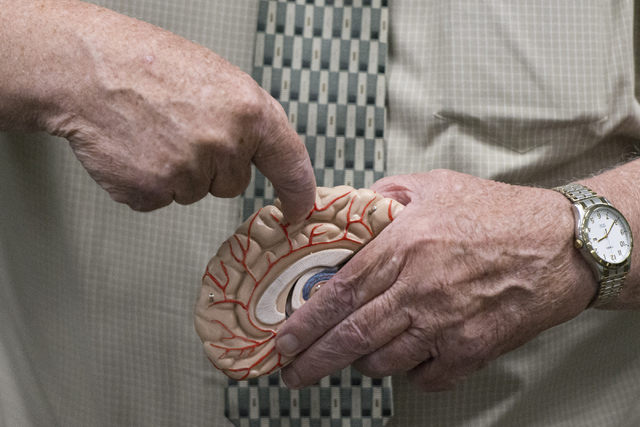 Through hands-on experiences, each group works together to figure out the diagnosis. Area physicians and medical professionals teach participants basic skills, including how to use a stethoscope, how to read an X-ray and electrocardiogram (EKG) and taking blood pressure. 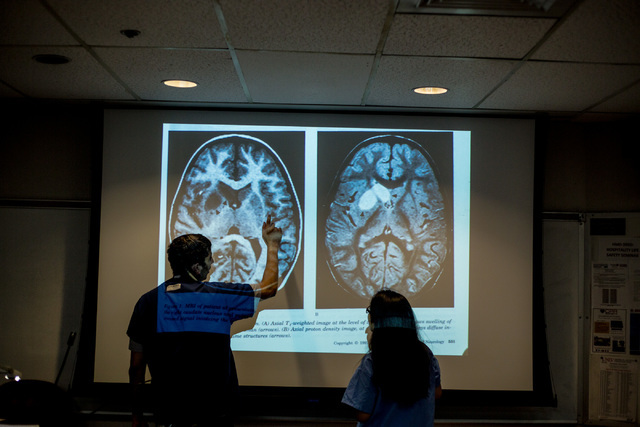 These findings are reported by each group to their peers, parents and teachers during a formal, 10-minute PowerPoint grand round presentation on the last day of camp. Also, during the final day, in a graduation-like ceremony, all participants receive a beginning doctor, or BD, degree. As part of the program, the young participants are given a genuine college experience, staying overnight in the dormitory and eating in the dining commons. 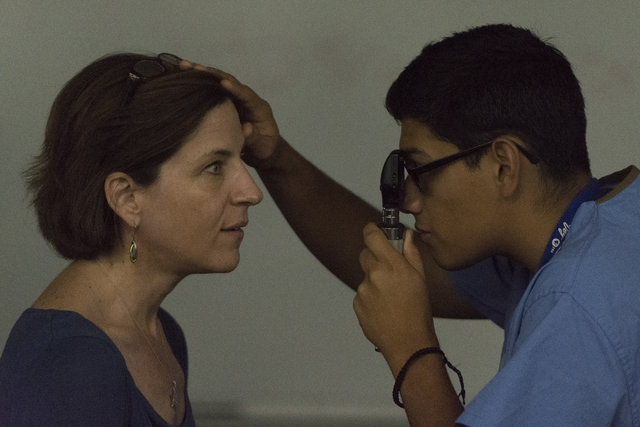 According to Huddleston, the program is facilitated by numerous volunteers, including area physicians and health care professionals mentoring, facilitating and teaching the students. As a way to retain the participant’s interest, Rosenthal developed reunion events for the students to gather together annually and solve a quicker case. The next one will be held Feb. 25 at the Touro University Nevada Campus, 874 American Pacific Drive in Henderson. He plans these reunion events to occur at different medical schools throughout the valley. This years’ reunion was held at Roseman. Rosenthal further plans to develop a way of long-term tracking the graduates to see how successful the camp is in inspiring careers in the medical profession. 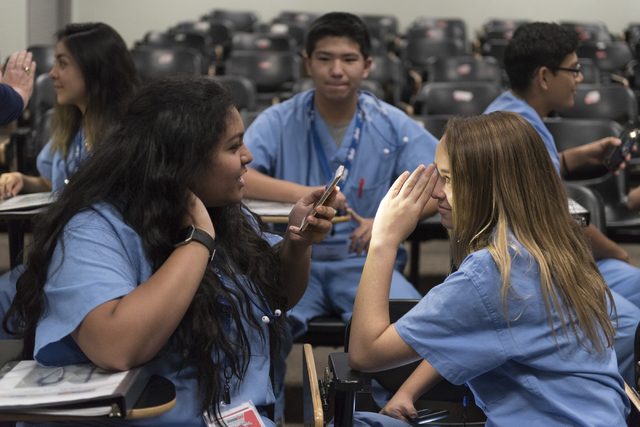 He has also devised other programs to reach additional grade levels on health care careers including a one-day event called Discover Med held at Roseman. The first CampMed was held the summer of 2016 with 49 participants. This past summer the program expanded to 60 and plans to stay consistent at that number. Each participant receives a set of blue scrubs, a stethoscope and workbook. The cost to implement the program is approximately $38,000 a year. The funds to cover the program are raised primarily through private donors and fundraising. CampMed is possible through the nontraditional partnership of Vegas PBS television and Desert Meadows AHEC. Previously, the local AHEC organization went bankrupt in 2011. 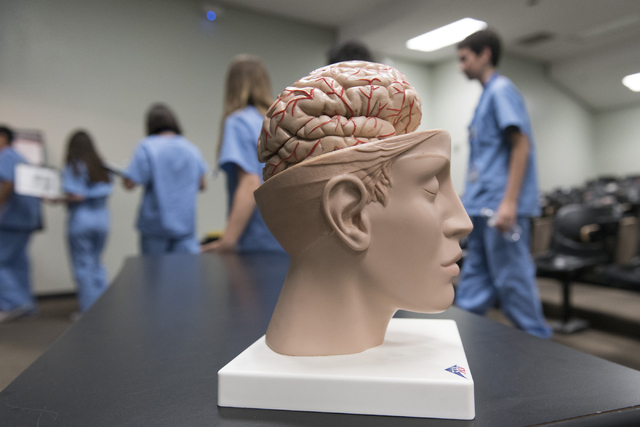 To find a replacement, the Reno School of Medicine, which has the contract to distribute grants to the state’s AHEC organizations, approached Vegas PBS in 2014 to start a chapter. The School of Medicine approached the entity in part because Vegas PBS already fulfilled two of the three requirements needed for an AHEC organization. 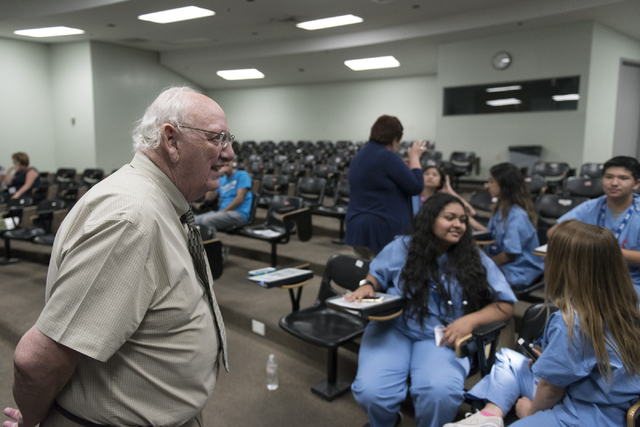 These requirements include connecting students to health care careers; health care students to the community they’ll serve; and community to better health through seminars and workshops. 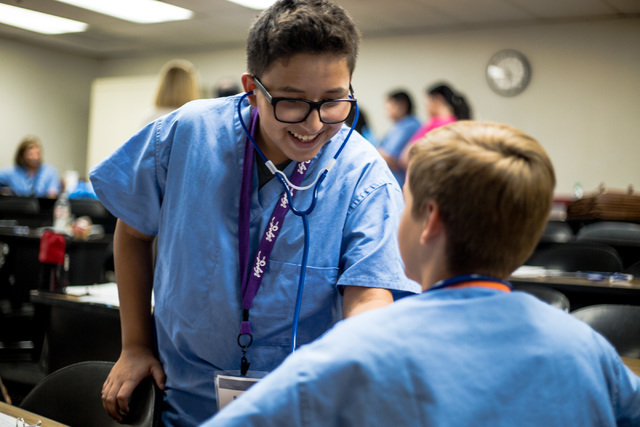 CampMed is open to area graduating eighth-graders who are interested in a health care profession and have a minimum B grade in math and science. Applicants are required to submit transcripts of their grades with application. The cost of the program is $349 per student and limited number of scholarships are available. Next years’ camp is planned for July, with the actual dates yet to be determined. Desert Meadows AHEC plans to begin taking applications early spring. Anyone interested can register on line at vegaspbs.org/desert-meadows- ahec/ or contacting Desert Meadows Area Health Education Center at Vegas PBS, 702-799-1010, extension 5421.